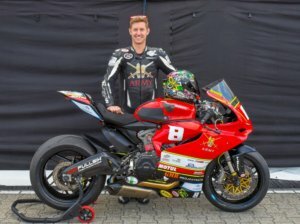 Sponsored by Chamois, RSF Racing, a UK-based, amateur motorcycle racing team competing at British Championship level, in association with the Army Road Race Team, have completed their first year in the Ducati Tri-Options Cup riding a Ducati 959 Panigale. Rider, Richard Spencer-Fleet, has put together this end of season review for their ‘rookie’ season. 2017 was a horrendous year. Having broken my neck, back, elbow, smashed my hand to pieces and dealt with a hefty head injury, everyone thought the bike-racing chapter of my life would be over. Not so. During the months spent recovering at home, racing was one of the few things that kept me motivated. My aspiration was to compete in a British Superbike support class; realistic as my lap times in club racing weren’t too far out. So, a month after my accident, I found the bike. A Ducati 959 with 900 miles on the clock. Decision made – the Ducati-Tri Options Cup was on. The plan was to test the bike over winter and slowly build the bike over the next 7 months. Winter testing at Cartagena went well and I felt at home on the bike, even after nearly 11 months out of the saddle. 2018 was set to be an amazing year! 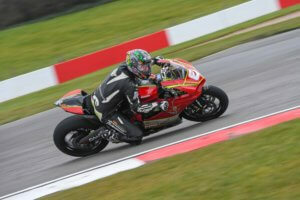 Round 1 at Donnington Park was always going to a leap into the deep end after a year out of racing. The weather was horrendous and, having never ridden the bike in the wet, it was all new. Everyone’s emotions were running high. I was nervous, as were my supporting family and friends; especially those who had seen what I had been through and how I had pushed myself to get back on the track. Race 1 was mental! The start was like none other I’d ever been in. If you left a space it was immediately filled; if there was nearly enough space it would also be filled. Ruthless! Finishing 31st, I knew I had to change my mindset for Race 2. With a slightly drying track, Race 2 was scattered with crashes, so to finish 25th was definitely what was needed. Smiles on everyone’s faces, finishing a weekend of racing without crashing felt like a win! Brands Hatch Indy – Round 2. This track was always going to be tough. Not just for me, but for everyone who had seen me taken away in a helicopter nearly a year ago to the day. It was damp and cold. The tyres weren’t working well and I didn’t have the confidence in them to push hard. Despite my misgivings, with a dry line in Race 1 we finished the race in 25th on near PB lap times. Hopes for a dry Race 2 disappeared when, just before the race, the heavens opened and my pit crew had to quickly swap wheels minutes before the start. It was wet, wet, wet! Finishing in 24th with a bike in one piece was a Result! Round 3 took the team to Oulton Park. We were lucky enough to test a week earlier and found a great base setting; we were already on PB pace. The weather was the complete opposite of Round 1. Think back to May, when it could have been mid-summer. The temperatures were into the 30’s so the bike’s tyres and settings were completely different. The track was so enjoyable to ride and we had some great battles in both races. Finishing 20th in Race 1 and 23rd in Race 2, we were defiantly going in right direction for the season ahead. Then it happened. We have found it crucial to arrive at each circuit with a base suspension setting and gearing ready to go, so we went to Snetterton for testing before Round 4. But it wasn’t to be. During testing the bike had a catastrophic failure – the engine locked up and the bike spat me off. I got away with the crash but something big had gone wrong with the bike. The next few months watching the season go by, while we worked on getting the parts and money together to fix the bike, were so, so hard. Snetterton passed, Brands Hatch GP and Cadwell. Then I got the call to say the engine was good to go! With a quick drive to collect, the bike was put back together and within 18 hours we arrived at Castle Combe for a run-out to test. The test went well and got us up to speed for the next round at Silverstone. I simply cannot thank everyone enough who helped in all aspects of the rebuild. Round 7 at Silverstone was the penultimate round of the ever-so-short season and we were hoping to be up to speed after testing at Castle Combe. Head-speed was there, but during practice and qualifying we couldn’t get a suspension setting that I was happy to push hard with. After a good chat with the team at Ktech we thought we might have a good setting. 24-hours later we first got to try it in Race 1 – it worked! Finally it felt like we could start to go with the pack. We had some great battles over the weekend and finishing both races in 23rd after so much time off the bike was mega. Assen – Round 8! WHAT A PLACE! WHAT A CIRCUIT! I cannot wait to go back there! 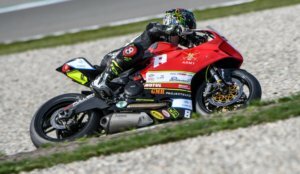 Having never ridden Assen, only ever watched some YouTube clips, I didn’t really know what to expect. Apart from it being FAST. Practice was hard; trying to stay with lads that had been there before and knew the lines. Making a mistake there could really end badly. Having exceeded track limits a few times in practice, we knew where we could make up a bit more time. Gearing and suspension changes were needed for a mega weekend’s racing. To end the season on such a high was amazing with the best results of the year: 19th in Race 1 and 18th in Race 2. Everyone came away smiling. The plan is to race again in the Ducati Tri-Options Cup 2019; we’ve got the bike, we’ve got the knowledge, we’ve got the determination to do well. Want to come with us on this journey? The 2018 season would not have happened without the amazing backing of family and friends who have helped in countless ways to get me back to fitness and supported my return to racing. I cannot name you all as I wouldn’t want to forget anyone. MASSIVE THANK YOU – you know who you are! On to all my sponsors and those that allow me to race. THANK YOU! I can only hope that I’ve done you proud and look forward to continuing our partnership into 2019.